"You can thank synchronizers for the quick, smooth transitions that you love when shifting your own gears. These unsung heroes in a manual transmission are critical to shift quality and performance. We want to give you a better understanding of how they work and some of the key technical advancements in the synchros we use in TREMEC transmissions. There are several variations in the specific configuration and components used in synchronizers, but this basic function is the same. These are the components that make up a typical synchronizer assembly. 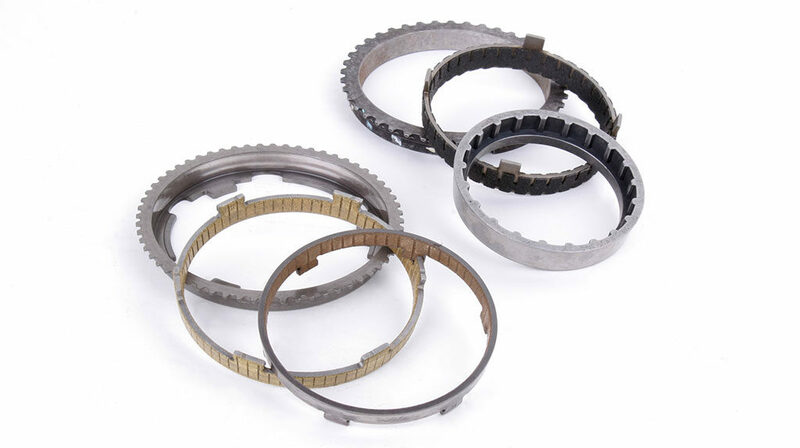 This specific design is used in the TREMEC T-5 and TKO 5-speed transmissions. In most manual transmissions, gears ride on the output shaft and are meshed to gears on the countershaft. To engage a gear, the slider slides over the teeth on one of the gears. This locks the gear to the output shaft and completes power flow through the transmission from the engine to wheels. The synchronizer adjusts shaft speeds and aligns the gears as you shift so the slider can mesh with the next gear. There is more than one synchronizer assembly in a manual transmission. The exact number depends on the number of forward gears in the transmission. You can watch how the process works in this animated video. You can see the blocker and friction rings from the TREMEC TR-6060 and Magnum at left and the T-56 at right. Note that the number of friction surfaces is what designates the basket as a double or triple cone. A further improvement on the standard synchronizer design are multi-cone synchronizers, as used in the TREMEC Magnum 6-speed transmission. 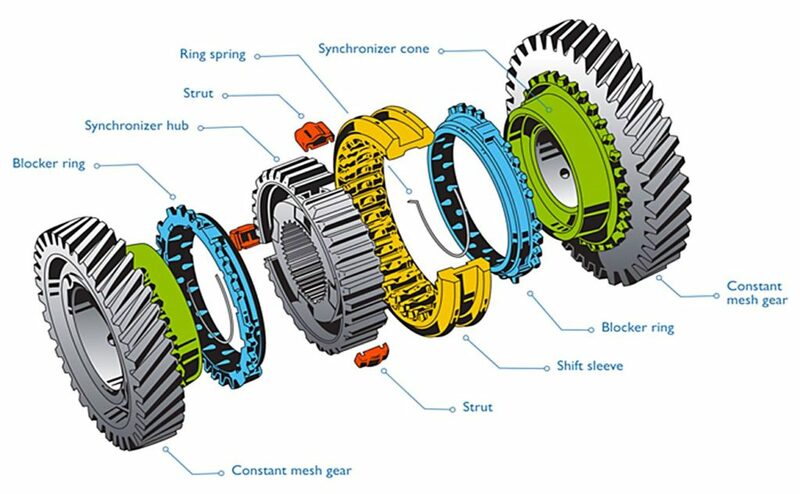 The multi-cone design increases the amount of friction surface area the synchronizer can utilize to sync the gear speeds, making for even quicker shifts and raising the rpm range."